Robust and effective planning and collaborative working throughout the child’s journey in care, and between a range of professionals and organisations. The Early Permanence Quality Mark stems from a Practice Improvement Fund from the Department for Education to develop and promote best practice in early permanence planning and placements across the sector. The Quality Mark (QM) has been designed and developed in consultation with a range of local authorities (LAs) and Voluntary Adoption Agencies (VAAs) in order to benefit from experience across regions. It is shaped by what works and what agencies said to be important in ensuring good practice in early permanence and has the central aim of promoting consistent and coherent practice. The Quality Mark is relevant to all registered adoption agencies. This includes those involved in early decision making, approving and preparing carers, placing children, supervising early permanence placements, and the transition and support to their permanent family for a child or siblings. Applying for the QM is voluntary, and available to all adoption agencies in England who wish to demonstrate good practice or strive for improvement. How could the Quality Mark benefit my agency? Applying for the Quality Mark gives agencies the opportunity to review early permanence practice and innovate if appropriate within their local agency and region, using the QM descriptors to guide delivery plans and actions. providing the opportunity through an early permanence network to continually learn and reflect on experience and outcomes from practice, case law and examples of innovative delivery. For more details of the benefits for agencies, download the Quality Mark flyer (pdf version) or Read our Useful Tips on Applying for the Quality Mark. Links to resources for early permanence, including the updated Good Practice Guide to Fostering for Adoption in Early Permanence (available on the Coram Centre for Early Permanence Website). How does the Early Permanence Quality Mark fit with statutory guidance? The descriptors are informed by a growing knowledge base, case precedents, legal and policy application, and specific regulatory requirements. They coexist with statutory and regulatory guidance, Ofsted National Minimum Standards and the Knowledge and Skills Statement for Achieving Permanence. The descriptors do not replace any such guidance. What are the Early Permanence Quality Mark descriptors? The descriptors are designed to assist agencies in early permanence delivery and to act as guidance for submitting your application. Department for Education-led interviews with leaders in early permanence from LAs and VAAs through the Early Permanence Expert Working Group. legal perspectives via a series of judiciary seminars. The descriptors are designed to be read holistically, although not all adoption agencies will deliver all elements. RAAs, VAAs and LAs will hold responsibility for different aspects of the process depending on local arrangements. Read the descriptors in full on the Quality Mark descriptors page. Read the descriptors in full on the Quality Mark descriptors page. How will decisions be made on the award of the Quality Mark? Decisions are made through a qualitative moderation process, by an independent Moderation Panel comprising leaders in the field of adoption. A key facet of any quality mark is its credibility and integrity, that it reflects fair, equitable and reasoned decision making, along with comprehensive evidenced assessments. assessment by a panel of independent moderators with legal, practice and academic expertise in adoption services. Moderators receive training on the QM and the decision-making process. A convenor will administer the Quality Mark and respond to all applications and communications. How often will the moderation panel meet? The independent moderation panel comprises three adoption specialists considering no more than three applications per sitting. The panel meets at a frequency to meet demand, at a minimum of quarterly intervals so that agencies are not waiting a long time for a decision. Will agency remit make a difference to achievement of the QM? 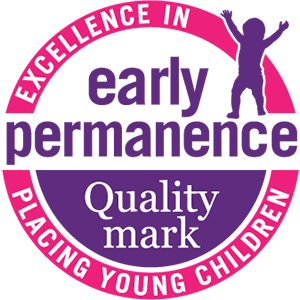 The Quality Mark is designed to recognise achievements across all agencies delivering early permanence and is therefore relevant to registered adoption agencies, local authorities, Voluntary Adoption Agencies and Regional Adoption Agencies. It recognises that agencies will have local arrangements, and partnerships that make up effective delivery. An agency will be able to demonstrate with reference to the QM descriptors how it delivers early permanence and the many ways it may contribute to the process of providing early permanence for children. Read our Useful Tips on Applying for the Quality Mark. Further guidance is also available in the application process. Find out more and Register to Apply. How will the Quality Mark work for RAAs? Regional Adoption Agencies are currently in operation, with others in development across the country, with a common platform of economies of scale and shared approaches to adoption services across member local authorities and voluntary adoption agencies. Many RAAs are actively considering how they work to promote and deliver early permanence and links to the child care teams. Applying for the Quality Mark and using the descriptors will support RAAs to develop their Early Permanence services and consider all relevant facets of delivery. The application process is flexible and allows for RAAs as a whole or individual agencies to apply. Read our Useful Tips on Applying for the Quality Mark. What is the duration of the Quality Mark? The Quality Mark is valid for three years following the awarding date, after which time it will require renewal. Agencies who achieve the Quality Mark will be provided with the QM logo and a letter confirming relevant dates. Evidence for renewal will require a stock take from the agency, action plans, and delivery priorities going forward, with reference to the Quality Mark descriptors. This process should prompt the agency to implement new practice or respond to policy changes. In many cases it will be a simpler process building on the earlier application and will attract a lower fee. Will an agency be able to appeal? Where a moderation board identifies significant shortfalls in a submitted application, the board may request further specific information before making a final decision. The agency will be given a time frame to respond. The panel will then make a decision to either award the Quality Mark or refuse it. If the QM is not awarded, a letter will be sent to the agency with a reasoned decision and a copy of the assessment decision template used by the panel. More detailed feedback will be given to the agency on request. An agency may undertake additional work and reapply after three months. All applications and their progress are managed in strict confidence. An appeal process will only be invoked where due process issues are identified in relation to fairness and transparency. There is a fee attached to all applications. This cost covers the convening and management of the independent moderation board and web information updates. Fees have been set at the lowest possible level and operate on a not-for-profit basis. Fees are inclusive of VAT. Click here for full fee scale. Find out more and Register to Apply.